Updates and news about the Raymond W. Kelly ’63 Student Commons construction project. Watch this video update, which is the next in a series of videos that will provide updates on the progress of the Raymond W. Kelly ’63 Student Commons at Manhattan College. As Manhattan College prepares to ring in the New Year, Andrew Ryan, P.E., vice president for facilities, announces that the Commons construction remains on-schedule with final turnover anticipated this July. The final glass panel facing was placed on Dec. 16, sealing the building from the chill of winter and allowing for the installation of ceilings, floors, furnishings, and partitions. On the first and second floor, construction of ceiling grids and studs is underway as well as the data and fire alarm wiring. Sheetrocking continues on floors two, three and four and the heating, ventilation, and air conditioning ductwork is 90 percent complete. With the power outlets roughed on all floors, Con Edison delivered electric service on Dec. 13, with gas service to come. Additionally, domestic water service is active. “The main focus over the next few weeks will be completing sheetrock, and starting on floors, lighting and ceilings in preparation for finish work,” Ryan says. From the groundbreaking to the dedication and everything in between, our students, faculty, staff, alumni, donors and friends are an integral part of the Student Commons project. Watch this video time lapse to see the construction progress from December 2012 to September 2013. The fifth and final floor was poured on Aug. 9, allowing the installation of the first floor HVAC ductwork and other utilities. And as Jaspers returned to campus for the fall 2013 semester, many marveled at their first glimpse of the commons’ stately silhouette. Ledwidge, who grew up on Waldo Avenue, says he enjoys “watching this beautiful and enormous building take shape as I walk to class everyday” and that he’s excited to see the enormous and positive impact on the campus community. Many of the newest members to the campus community — the class of 2017, in particular— have kept their eyes on the site’s progress since its inception by attending campus events, from open houses and accepted students days, all the way to orientation. As site work continues, the commons’ silhouette will be filled in. Interior utility work is progressing on the first and second floors, as well as framing for walls, and the layout of walls and utilities has started on the third floor. Additionally, the south end is taking shape: Construction of the retaining wall leading up to the former Quigley House site has begun, as well as significant rock removal that is required to create the on-site parking spaces. 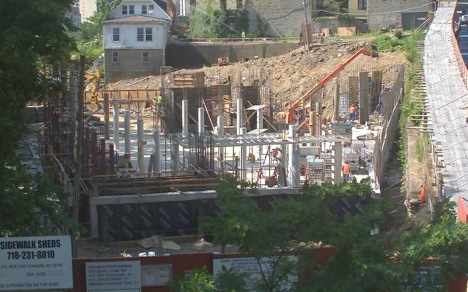 Watch this July 2013 update, which is the first in a series of videos that will provide meaningful updates on the progress of the Raymond W. Kelly ’63 Student Commons at Manhattan College. The Quigley House was recently torn down as part of the student commons construction project. Its removal will make way for new green space. 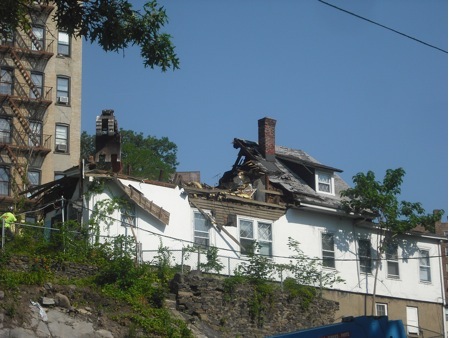 Quigley House was torn down June 21. Acquired by Manhattan College in July 1957, Quigley House was primarily used to provide accommodations for Christian Brothers and special guests visiting the College. Although it never received any major renovations or additions, its name was consistently updated — White House in the ’60s, Waldo in the ’70s and Newman in the ’80s. Quigley House was no longer used by the College with the addition of East Hill Hall, which offers spacious suite-style accommodations to 550 residents. The demolition crew arrived on the morning of Friday, June 21, and by 1 p.m., the one-and-a-half-story wood frame structure, located on the southwest corner of the commons building site was leveled. As the commons construction continues, supporting concrete columns and slab floors are being built. The second floor slab was poured July 1 and the third was completed July 18. With first floor columns in place, the second floor is installed.